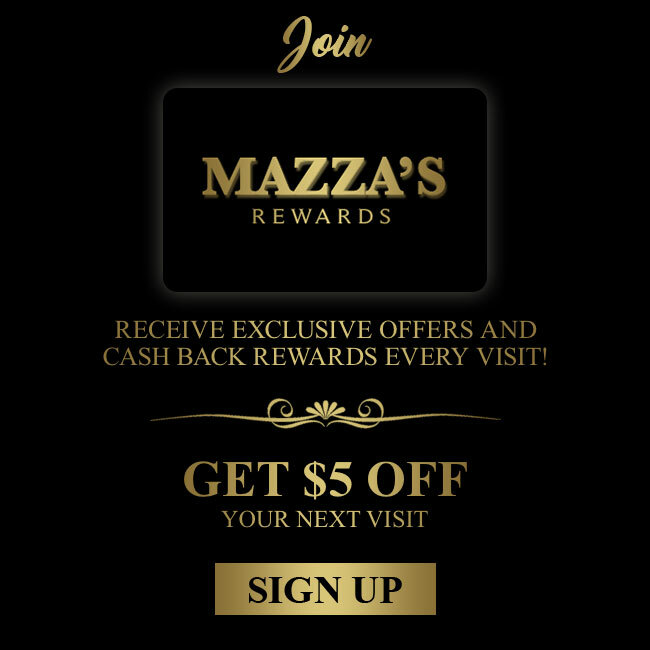 Mazza’s Rewards is the exclusive Mazza’s loyalty card program that allows you to earn Mazza’s Rewards for every qualified purchase you make at Mazza’s. All customers can join Mazza’s Rewards. There is no fee to join. Your rewards are automatically saved on your Mazza’s Rewards account. To redeem them, you must present either your Mazza’s Rewards card or the telephone number you used to register your Mazza’s Rewards card, at the time of purchase. Your Mazza’s Rewards card can also be used as a prepaid/stored value card (see below). As a Mazza’s Rewards member, you may receive special promotions, coupons and invitations to exclusive events at Mazza’s locations. You must present your Mazza’s Rewards card at the time of check out to earn Mazza’s Rewards. Click here for answers to frequently asked questions regarding Mazza’s Rewards. Mazza’s may make changes to Mazza’s Rewards, including, without limitation, the benefits of the program, at any time, and from time to time, without prior notice. Further, Mazza’s reserves the right to suspend or end the Mazza’s Rewards program without prior notice, in Mazza’s ‘s sole discretion. Mazza’s also reserves the right to suspend or end the Mazza’s Rewards program or certain aspects and/or benefits thereof in certain geographic areas without prior notice. Void where prohibited. Regardless of the dollar value on your Mazza’s Rewards card, you’ll earn Mazza’s Rewards every time you make a qualified purchase at Mazza’s location as long as you present your Mazza’s Rewards card at the time of purchase. Qualified purchases are determined by Mazza’s in its sole discretion and may be changed without notice. The purchase of a Mazza’s gift card and/or redemption of Mazza’s Rewards rewards are not qualified purchases; however, purchases (other than purchases of gift cards) made at Mazza’s location using a Mazza’s gift card and/or a preloaded Mazza’s Rewards card (other than use of any Mazza’s Rewards rewards) are considered qualified purchases. You cannot use rewards to purchase Mazza’s gift cards. Please note that your Mazza’s Rewards will expire on December 31 of each calendar year. The only way to redeem your rewards from Mazza’s Rewards and/or your birthday and other rewards earned is by registering your Mazza’s Rewards card and presenting your card at the register of a participating Mazza’s location at the time of check-out. Until you register your Mazza’s Rewards card, you will not be able to redeem your rewards. You will, however, continue to accumulate Mazza’s Rewards for qualified purchases in participating Mazza’s locations. Your Mazza’s Rewards card allows you to load a dollar value on to it for future purchases at participating Mazza’s locations. The dollar value that you load onto your Mazza’s Rewards card is a prepayment only for the goods and services of participating Mazza’s locations. No credit card, credit line, overdraft protection or deposit account is associated with a Mazza’s Rewards card. Unless otherwise required by law or permitted by these Terms, any amount on your Mazza’s Rewards card is nonrefundable and may not be redeemed for cash. No interest, dividends or any other earnings on funds deposited to a Mazza’s Rewards card will accrue or be paid or credited to you by Mazza’s . The value associated with the Mazza’s Rewards card is not insured by the Federal Deposit Insurance Corporation (FDIC). Only Mazza’s locations in Puerto Rico can accept your Mazza’s Rewards card. We reserve the right not to accept any Mazza’s Rewards card or otherwise limit use of a Mazza’s Rewards card if we reasonably believe that the use is unauthorized, fraudulent or otherwise unlawful. Customers cannot add value to a Mazza’s Rewards Card. Cardholders are not sent statements of itemized transactions from a Mazza’s Rewards card account. You can check the balance of your Mazza’s Rewards card or review recent transactions on your Mazza’s Rewards card by clicking here. You should keep your receipts and check your online statement to ensure that your account balance is correct. We reserve the right to correct the balance of your Mazza’s Rewards card account if we believe that a clerical, billing or accounting error occurred. If you have questions regarding your transaction history or any correction, or if you dispute any transaction or correction that has been assessed against your Mazza’s Rewards card, please contact us via our Contact Us page on the Site. We will conduct an investigation and communicate the results and correct any error that we verify as soon as we finish the investigation. If no error was found, we will communicate an explanation. We shall have no liability for any billing error unless you provide us notice within 60 days of the date of the transaction in question. You should monitor your transactions and account balances closely. Because your Mazza’s Rewards card is used like cash for purchases from participating Mazza’s locations, you are responsible for all transactions associated with your Mazza’s Rewards card, including unauthorized transactions. However, if your Mazza’s Rewards card is lost, stolen or destroyed, the card can be replaced with the balance remaining on it at the time of your call, but only if you have registered it with us. See below on how to register your Mazza’s Rewards card. Please notify us immediately if you change any of your registration information. If your Mazza’s Rewards card becomes lost, stolen or damaged, you should contact us via the Contact Us section of the Site. Your Mazza’s Rewards card balance is only protected from the point in time you notify us that your Mazza’s Rewards card is missing. We will freeze the remaining balance on your Mazza’s Rewards card at the time you notify us and will load that remaining balance on a replacement Mazza’s Rewards card. In order to join Mazza’s Rewards, you must first obtain and activate a Mazza’s Rewards card at any participating Mazza’s location. Then, register your Mazza’s Rewards card online here. After you register your card, you can start collecting Mazza’s Rewards for all of your qualified purchases. Please note that you must present your Mazza’s Rewards card at the time of purchase to collect your Mazza’s Rewards. You must provide us with your email address in order for us to be able to send to you special promotions, coupons and/or invitations to exclusive events from Mazza’s . If your Mazza’s Rewards card is ever lost or stolen, visit your local participating Mazza’s location and request a new Mazza’s Rewards card. We will need the new Mazza’s Rewards card number as well as the username or email address connected to your old account in order for us to be able to transfer your Mazza’s Rewards. You are solely responsible for managing your password and for keeping your password confidential. No one from Mazza’s will be authorized to provide you your password. If you forget your username or password, click on the “Forgot Your Password” link located here. For your privacy, we do not have access to your password information. However, we can reset it for you so that you can update your account with a new password. You are also solely responsible for restricting access to any computer you use to access your Mazza’s Rewards membership. You agree that you are responsible for all activities that occur on your account or through use of your password by yourself or by other persons. If we provide you with, and you opt for a “Remember me” feature for your Mazza’s Rewards account, a cookie helps Mazza’s recall certain items of your specific information on subsequent visits, including your username and password. When you return to Mazza’s Rewards, the information you previously provided can be retrieved, so that it is not necessary to enter your username and password to access certain functionality. While cookies are a convenience, please remember that if you elect the “Remember Me” option, anyone who can access the computer you are using will have the ability to access your account for certain functions and view certain information about your account. You consent to receive communications from Mazza’s about Mazza’s and/or your Mazza’s Rewards membership electronically, either by e-mail or by notices posted on this Site, as determined by Mazza’s in its sole discretion. You agree that any requirement that a notice, disclosure, agreement, or other communication be sent to you by Mazza’s in writing is satisfied by such electronic communication. You agree that Mazza’s may send you emails which include notices about your account as well as information pertaining to our service, such as featured products or new offerings. You agree that this information is part of your membership and your relationship with Mazza’s . Mazza’s may suspend or cancel your Mazza’s Rewards membership account, or otherwise restrict your use of any of Mazza’s ‘s services, in Mazza’s ‘s sole discretion, with or without cause.